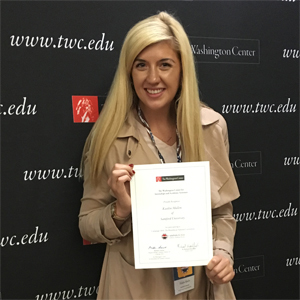 Samford University history and political science major Kaitlen Mullen of Norcross, Georgia, participated in the Republican National Convention last week through an internship at The Washington Center (TWC). The educational organization offers semester and summer internships in the nation’s capital while allowing participants to maintain full-time student status. As a leader in academic experience, TWC has helped more than 50,000 students from across the globe gain experience in many fields of study. TWC sends students to both the Republican and Democratic nominating conventions, combining an inside view of national politics with academic structure and hands-on experience. Along with undertaking various jobs during the convention, students also participate in academic learning, attend briefings, participate in small groups and hear from experts in the field. Mullen also attended the Washington Center Campaign seminar the week before the convention, where she learned about the history of the United States convention process, interpreted the 2016 election cycle, and heard from speakers including Secret Service agents and Cleveland, Ohio, police chief Calvin Williams. Mullen always desired to attend a convention and was well qualified for her position. She previously interned with Rep. Robert Aderholt (R-AL), worked on Marco Rubio’s presidential campaign and currently serves on the executive board of College Republicans at Samford. Erin Bognar is a journalism and mass communication major and news and feature writer in the Division of Marketing and Communication.